Following a YouTube teaser reel that outed the "pocket friendly" LG G Pad 8.3 in a more official manner, LG has now given a vague release date for its upcoming tablet. The Pad will be available in certain markets in the fourth quarter of this year, though that's as specific as LG is getting for now. There's also nothing given in terms of a price but LG promises we'll hear that "at launch time." But if Q4 feels too far away, an alleged leaked press render courtesy of MovePlayer should keep your eyes busy. 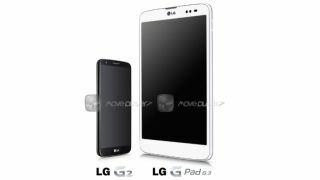 As we can see, the Pad seem to be following the design style of the LG G2, with a few small differences such as speaker and camera placement. And the fact that it is, you know, a lot bigger. There are no more details on the specs but the tablet is rumoured to be coming with an 8.3-inch 1920 x 1200 resolution, quad-core processor and 2GB of RAM. The last tablet we saw from LG was the Optimus Pad LTE back in 2012. The G Pad 8.3 is believed to be getting it's big reveal at IFA 2013. We'll be there to bring you the news as it breaks.